Today I have an engagement card to share with you. For this card, I used one of my distress ink blends I have been doing for a little while now as my background. The colours of distress inks used are: Worn Lipstick, Spun Sugar, Milled Lavender, Hickory Smokes and Black Soot. On top the background panel I added die cut using W&W The Leaf Effect Cutaway in white. 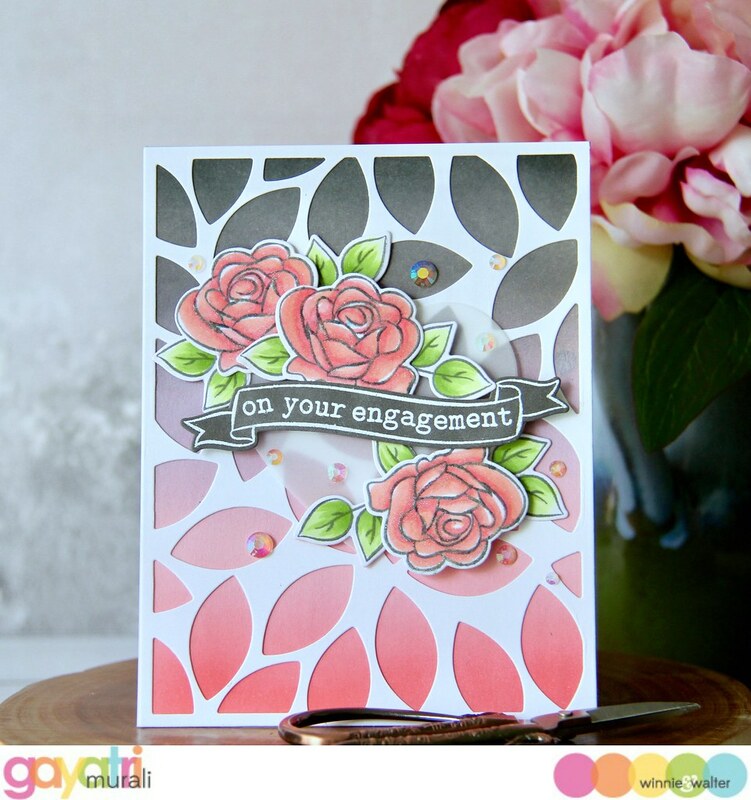 Love the colours peeking out of the die cut and the white die cut softens the grey and pink colours. For the focal point, I used vellum heart die cut, cut using the W&W Flawless Heart Cutaway as the base. 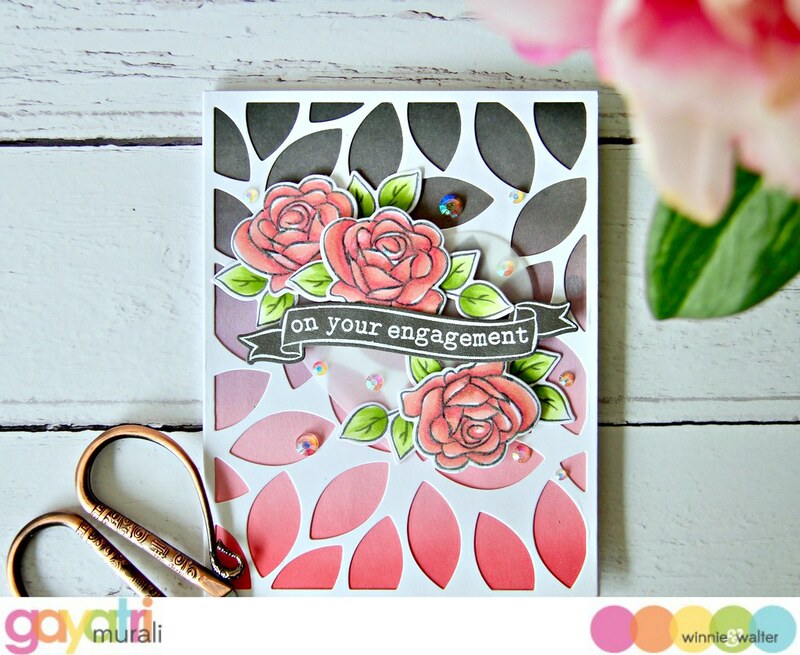 Then I stamped the flowers and leaves from W&W The Big, the Bold and Extras stamp set using grey moments ink and coloured using Altenew Artist markers. Then using the coordinating cutaway, I die cut them all out. I stamped and coloured three flowers and seven leaf images in all. For the sentiment, I white heat embossed the banner with the sentiment from the same stamp set on Simon’s Slate Gray cardstock and die cut using the coordinating cutaway. 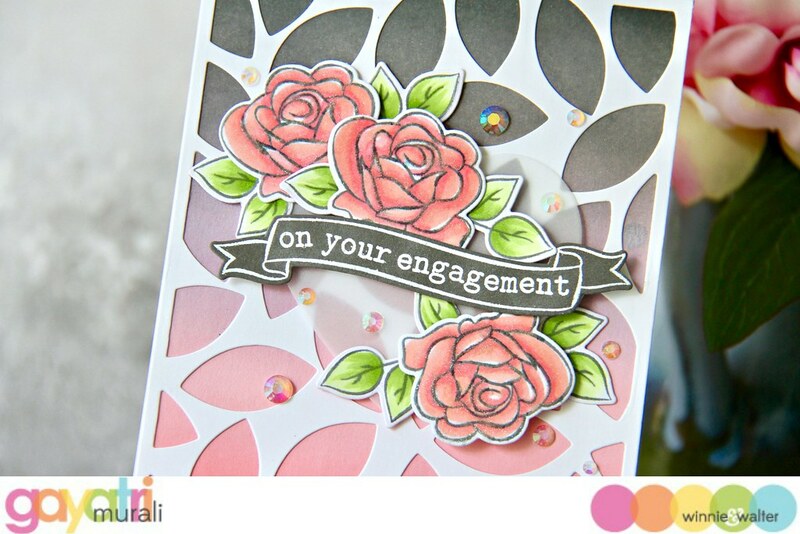 Then assembled the sentiment banner with the floral clusters on the vellum heart die cut as shown in the card. All the images except the leaves are adhered using foam adhesive for dimension and the leaves are glued down. This entire cluster is adhered now adhered to the card front panel using foam adhesive hidden behind the banner and floral cluster. The panel is glued to the white card front. To finish off the card, I used some jewels from Pretty Pink Posh. I love the colours on this card. No sharp contrast because I used grey and soft pink with white instead of the black and fuchsia pink colours. 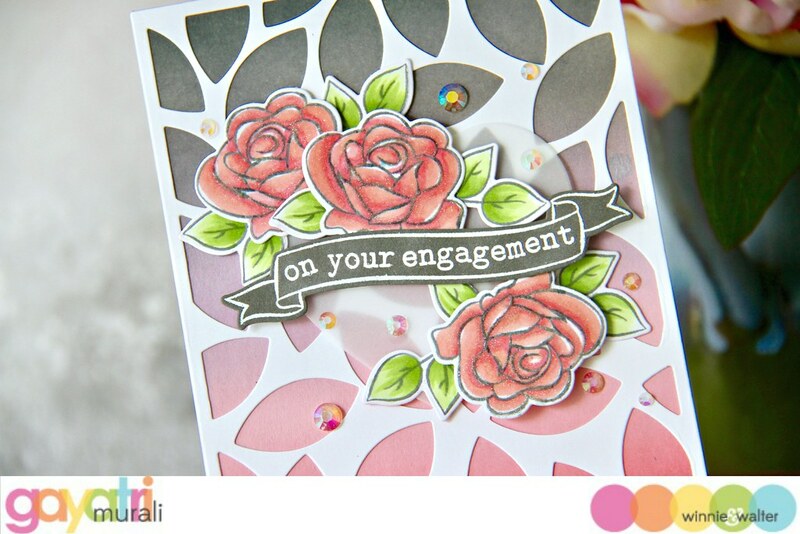 Vellum heart die cut also soften and the jewels brings the bling to the card. Hope you like the engagement card. All the supplies used to make this card are listed below.